Wow!!! It looks amazing! Those shelves and the lighting in the guitar corner are awesome!! Love all the touches! What a cool room!! 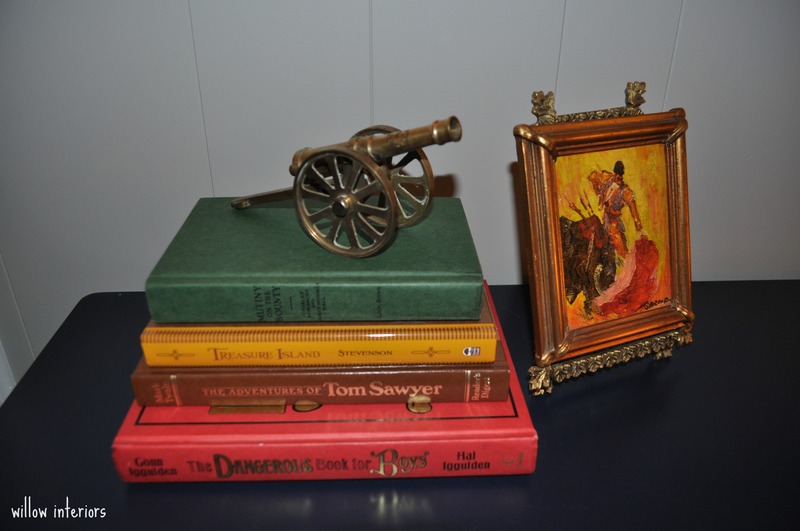 Kate….so many thoughtful items in this room! It’s cool and hip….you did an awesome job! 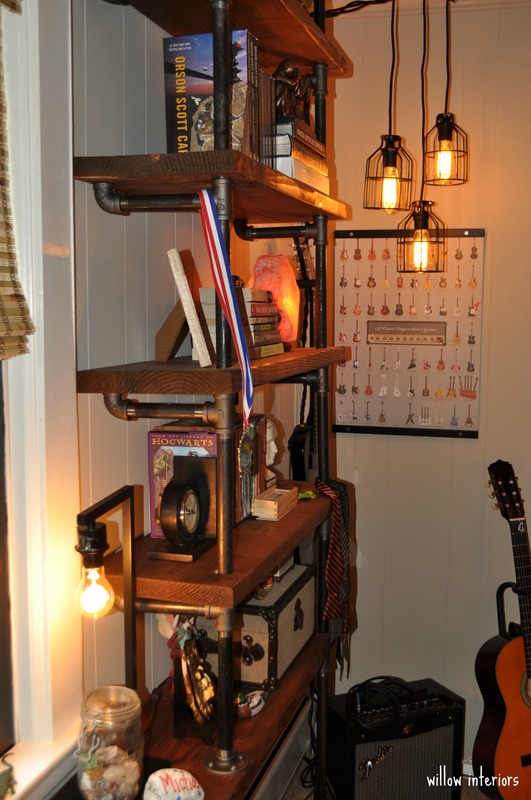 I love the bookshelves so much and all of your lighting sources! Congrats. Kate I just love the rustic details in the room. It’s a teenage boys dream! you did a fabulous job – what a lucky guy! It looks FABULOUS!! 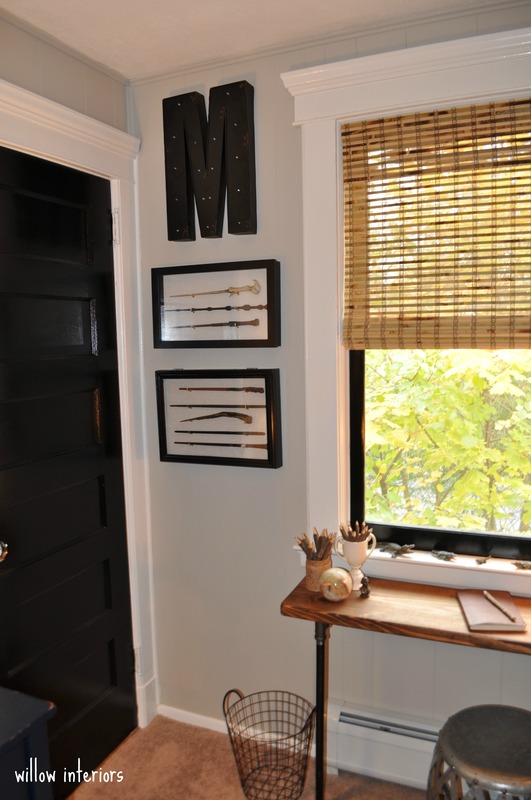 I especially love the door & trim paint, it gives the room a custom look and of course the accessories are awesome! Well done! Wow~ An absolutely stunning space! 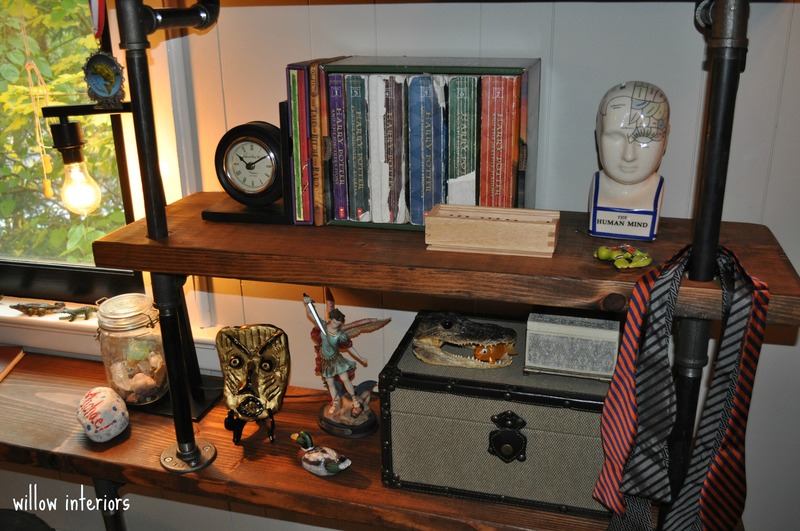 I adore the shelving. As a fellow 6 week participant the six weeks was indeed a challenge and you rose up. Well done! This is incredible! 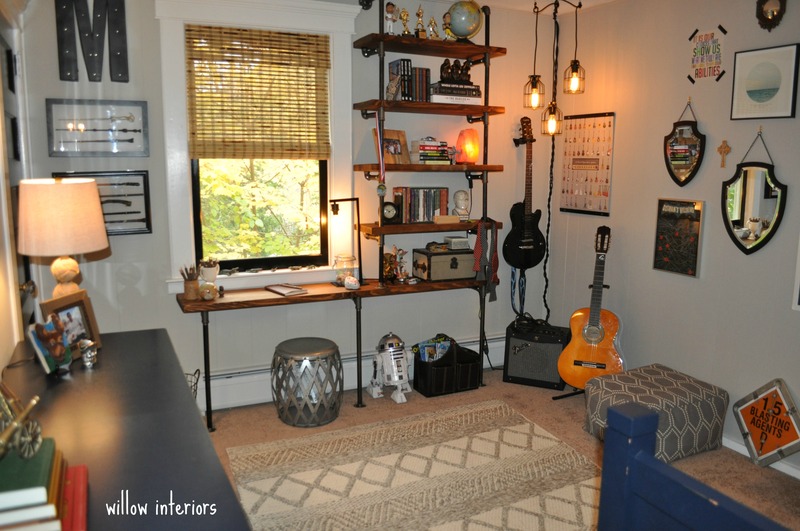 I absolutely love the shelves and desk you built. I really love the industrial look throughout! What a lucky teenager! 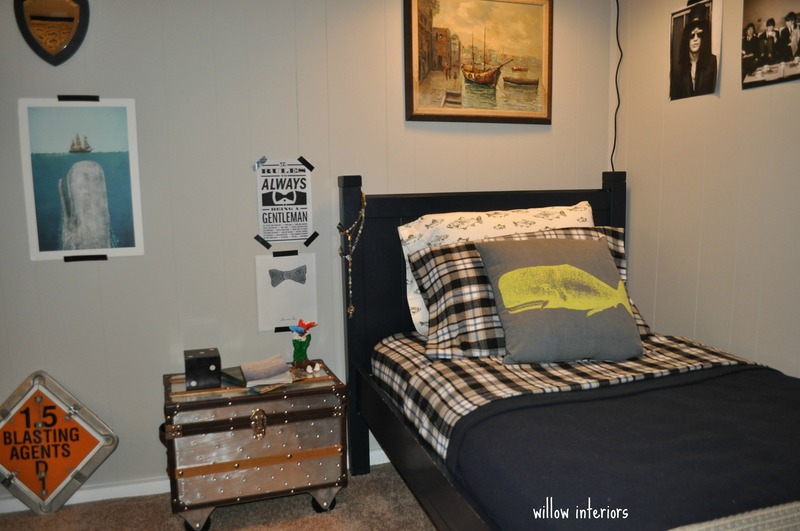 what a great space for your son! 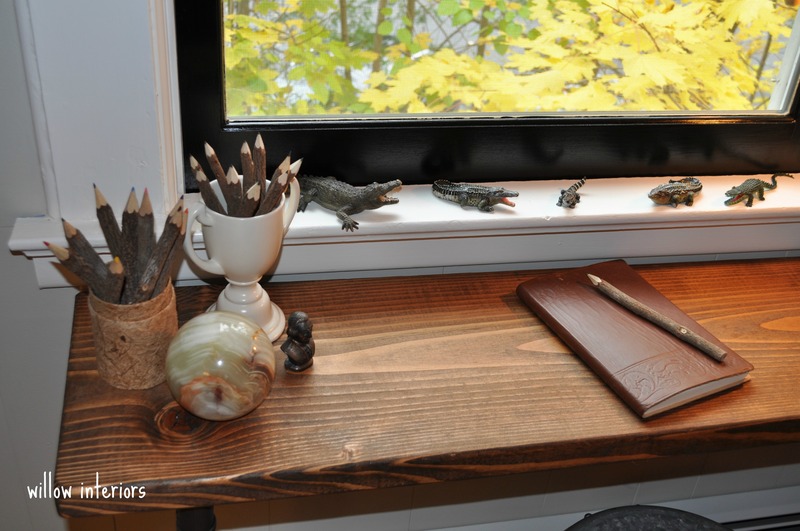 i love that storage/desk wall—and how amazing that you made it for around $200! his personality is just bursting at the seams in this room. 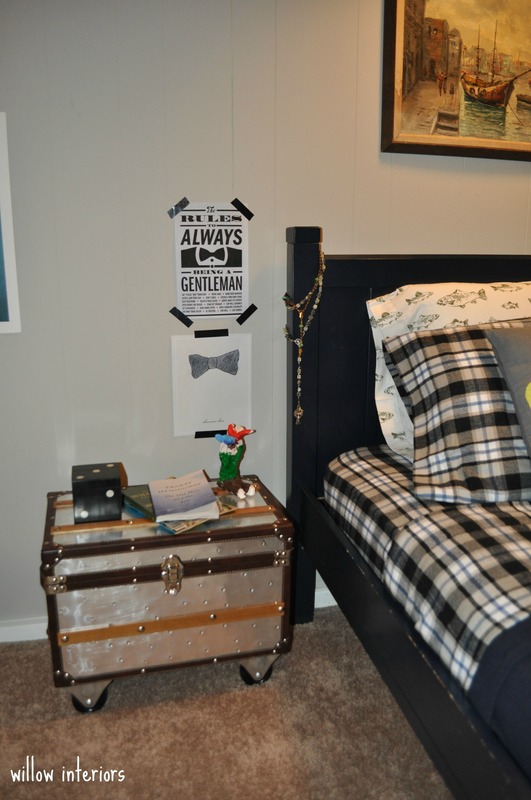 it is masculine, tailored and definitely fit for a teen! Those shelves are incredible! Outstanding job! 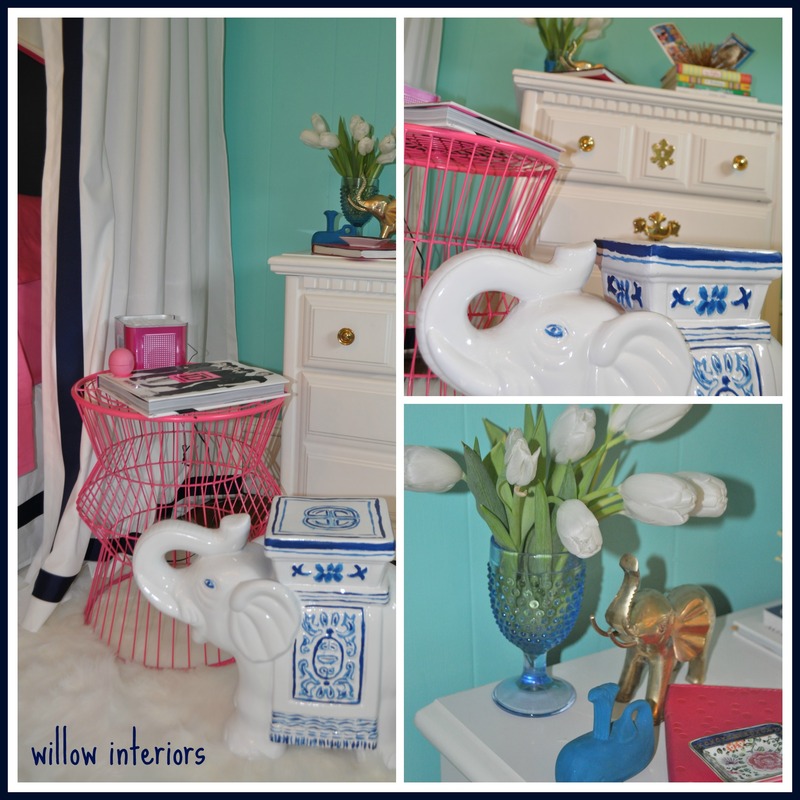 Kate, it has been so fun watching your son’s room transform over the last 6 weeks! 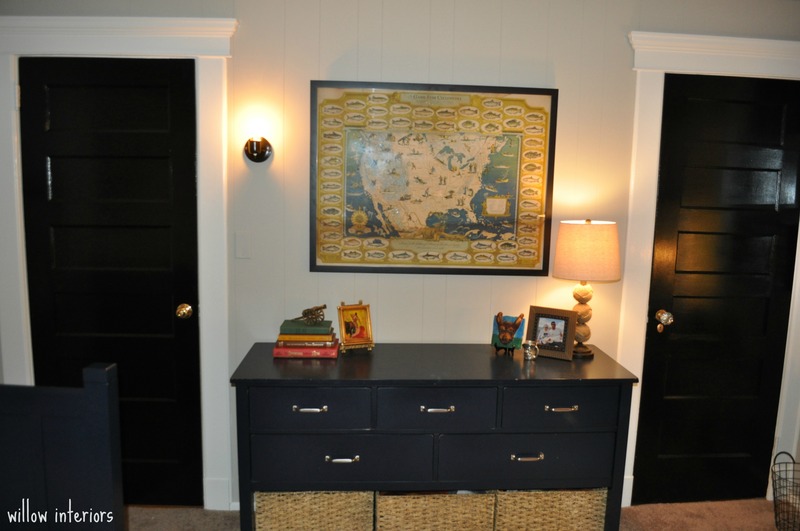 Wow, those doors and the dresser look AMAZING! I haven’t taken the plunge of painting the doors in our house but it makes such a dramatic difference. 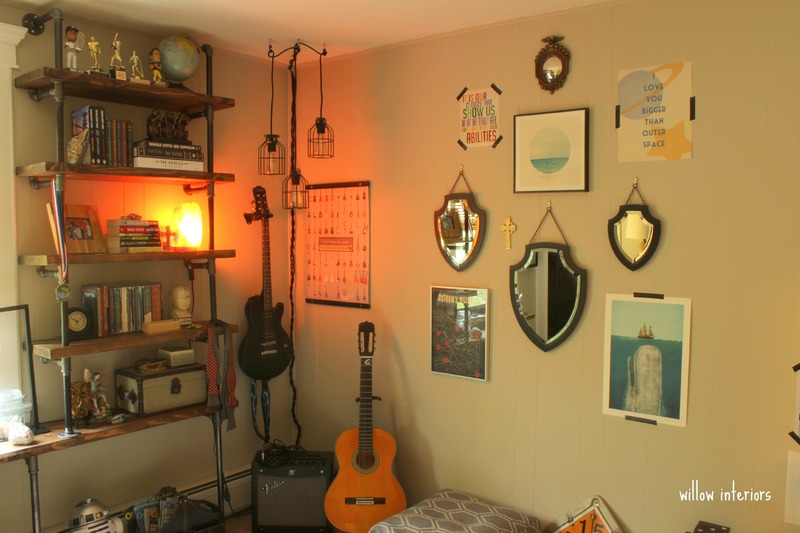 That night stand it fab but the $200 DIY industrial shelving is something to oh an ah over! BRAVO my ORC friend on yet another fab ORC space! 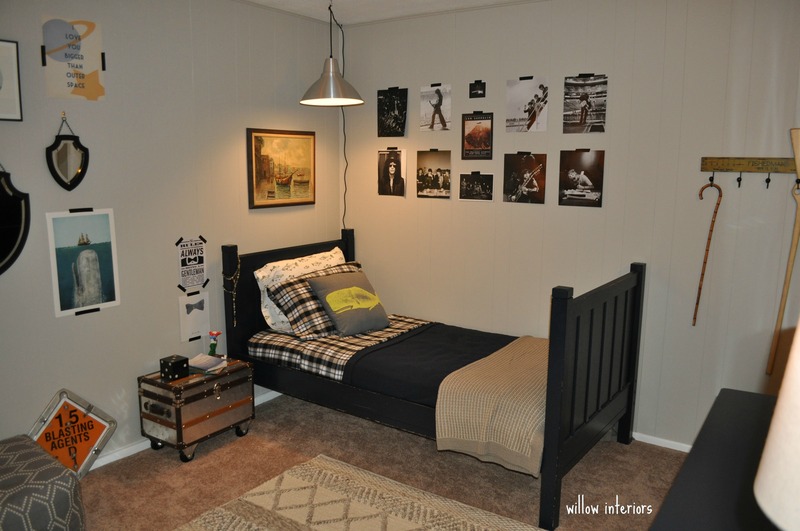 I know your rock n’ roll/country fan will absolutely love his new room! 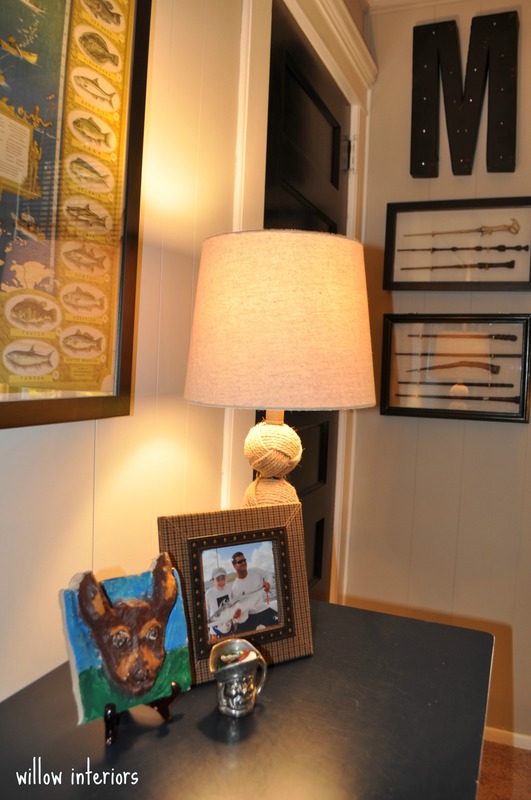 Michael must love his super cool room! 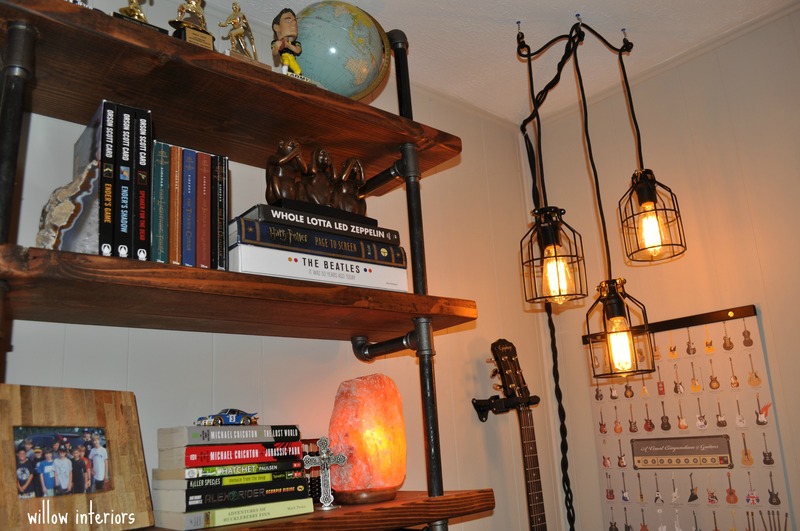 Those industrial shelves are awesome! Yay! This came out great. I love the authentic styling. 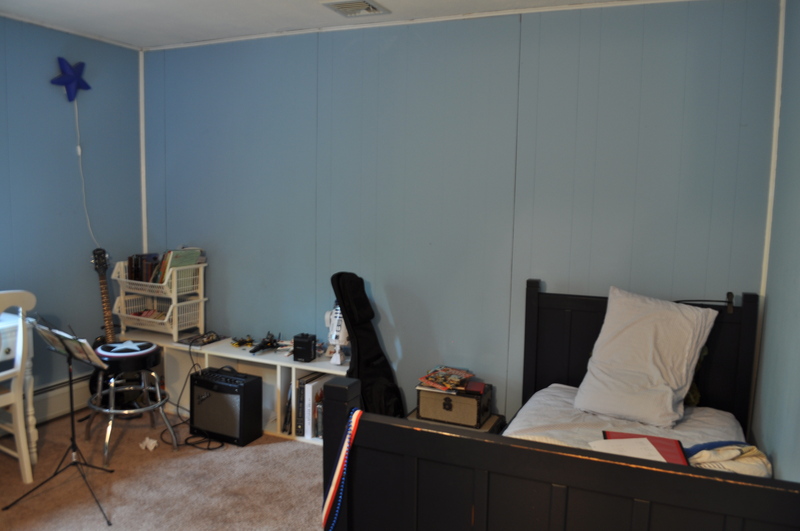 It actually looks like a boy’s room. 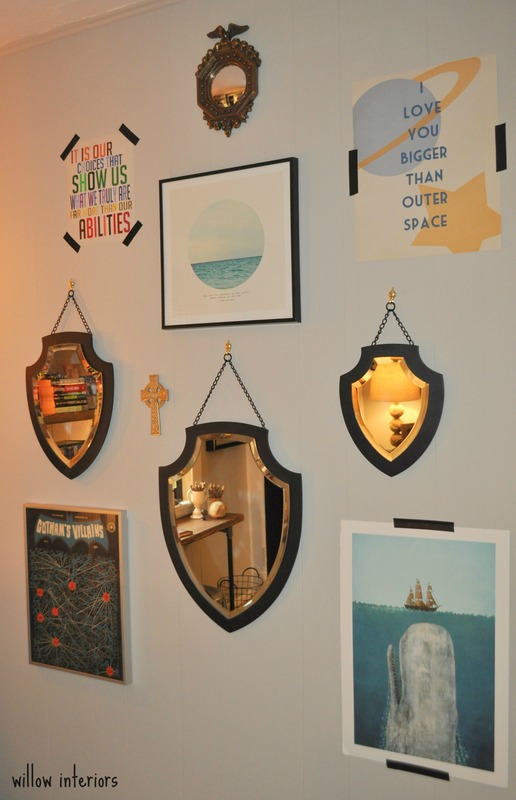 Love the shelves, the black trim and the electrical tape to hang the prints. Love the lighting! Looks great. Great job Kate! Michael must love it. Very cool space. Love the black and white rock photos. The shelves turned out fabulously! Congrats on a job well done! Looks amazing. I’m a huge fan of the Revere Pewter. I have never seen it not look good. Does that make sense? Great job on the makeover!!! The space looks great! I love the industrial yet functional shelf/desk! Congrats on another successful ORC! 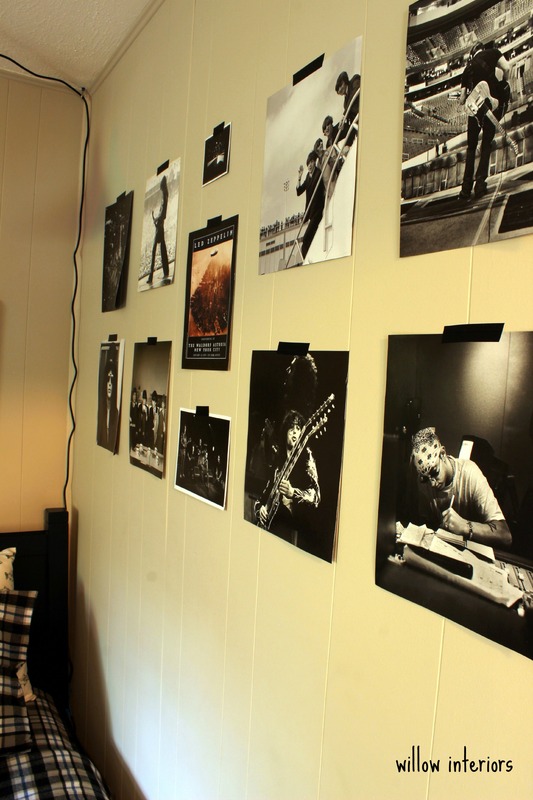 Michael is one lucky guy…this room looks fab! 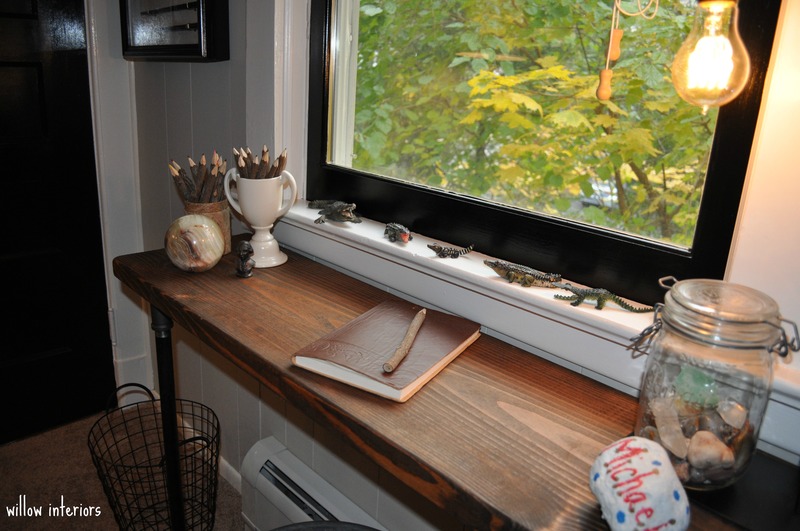 Love the way the desk/shelves turned out. Great job! Awesome room. Love the look of all of the accessories. 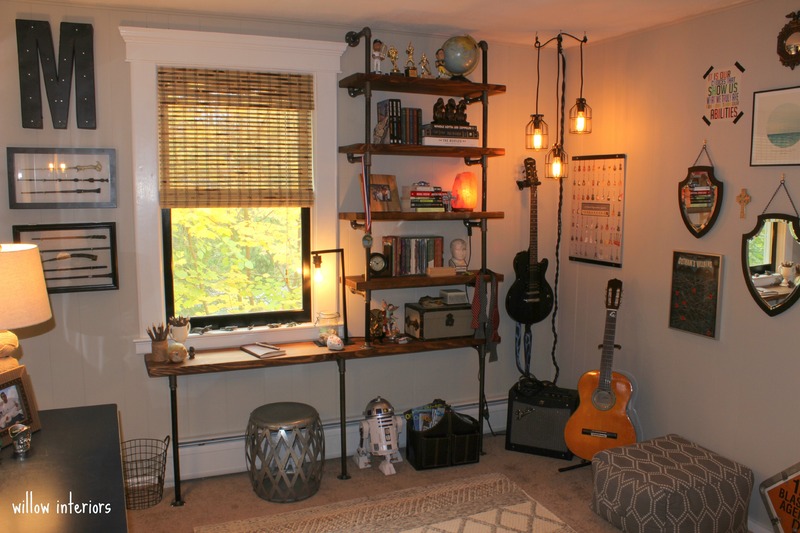 great teenage boy space! Michael is one lucky guy! Hi Kate. Michael cannever be mad at you any more 🙂 His room screams, “no girls allowed”. It is filled with so many manly touches. It looks awesome! 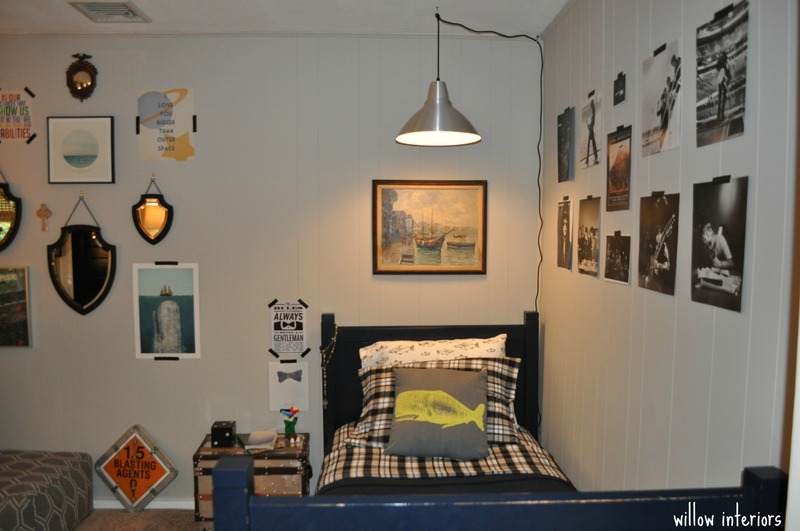 This looks like a perfect room for a teenage boy and I am sure your son is thrilled with the space you’ve created for him. 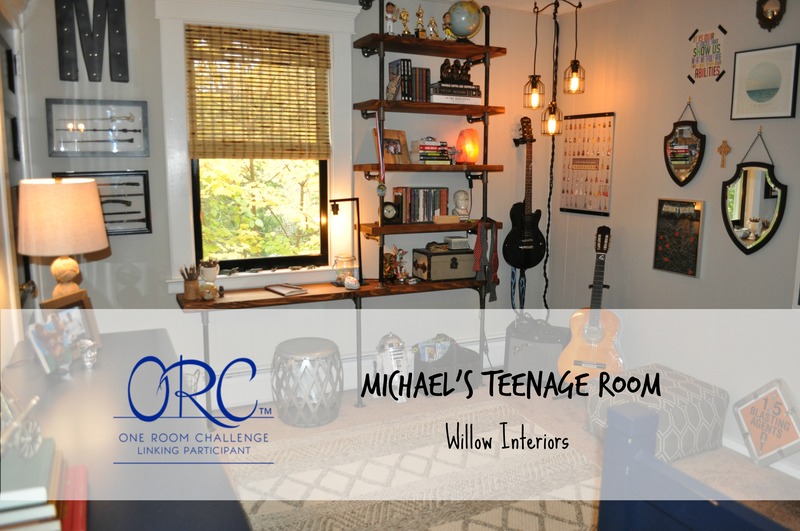 How fun that all of your kids have received ORC rooms! I definitely think your room should be up next! 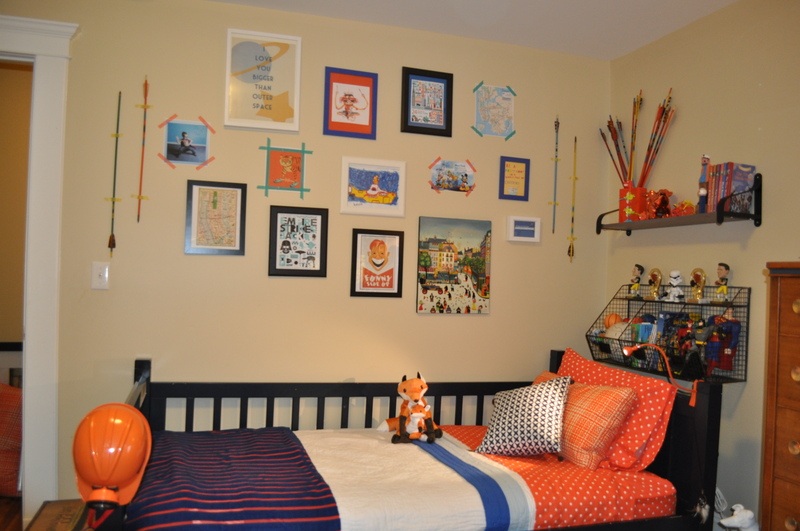 I did my toddler son’s room in the spring, and our master suite this fall. It feels so great to have our own space as nice as our son’s now. This is a great space! 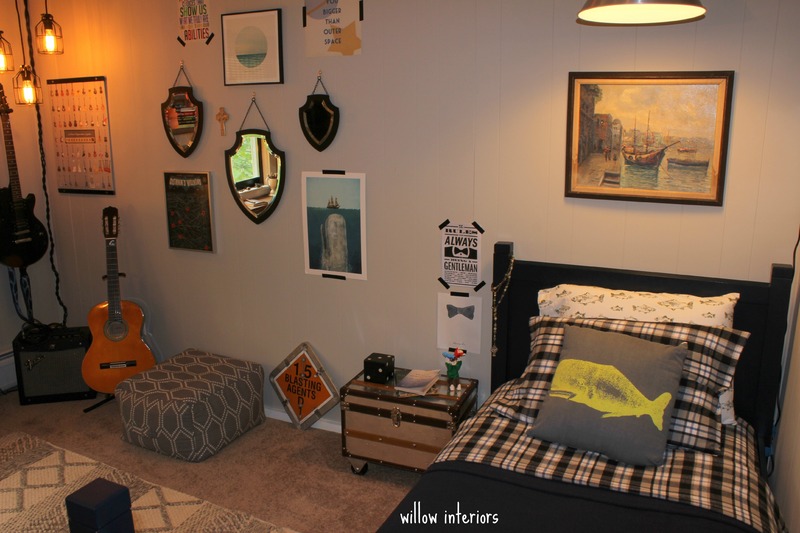 I love how it shows his personality in every detail–exactly how a kid’s room should be 🙂 That little bullfighter oil painting is so fabulous–I want one! Kate, It looks wonderful!! The room truly screams Rock and Roll!! What a transformation and it looks great! Great space! I’m sure Michael is thrilled with it. It all came together so well! Congrats! Love this room, Kate. Those shelves look fantastic. I love all the personal touches. Great job. Great job on the shelves! What an attention to detail! Looks great! I am such a bad follower! i looked at your photos right after you posted and forgot to comment! well, it’s all amazing!! 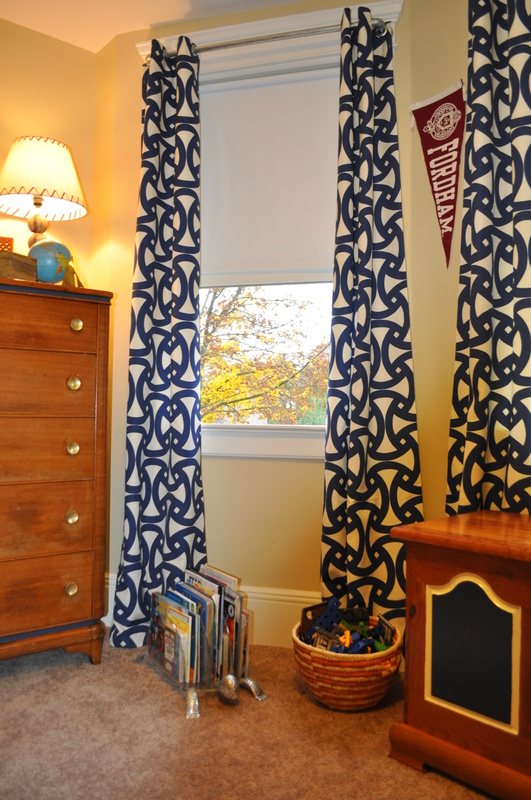 I bet your son is thrilled to have such a great space. 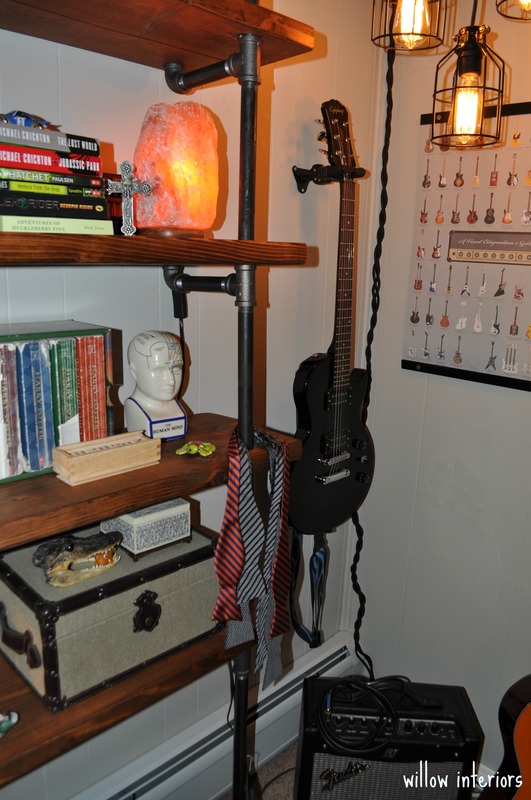 the mix of rustic, industrial and rock n roll is perfection! hope to see you back in the spring! Looks fab!!!! !I’m sure he’s thrilled! great job! Kate!! 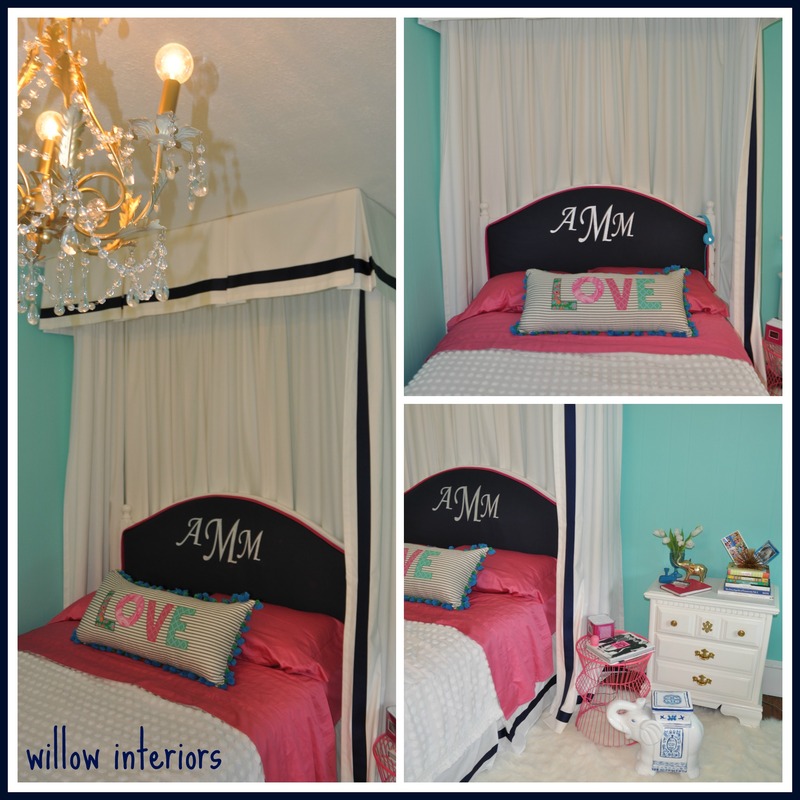 I don’t know how I missed this big reveal but the room came out so great!! The bookcase wall is amazing, wow!! Also the wall color with the crisp white trim and dark accents, I’m a huge fan. 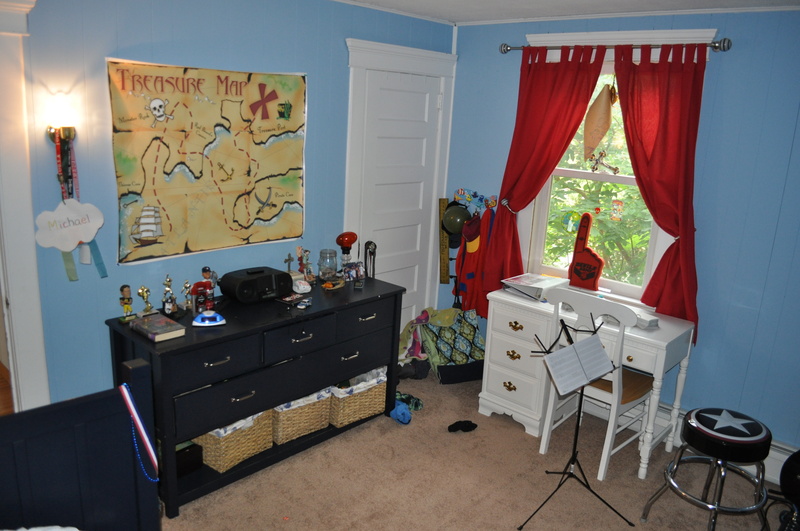 What a cool room for your son, he must be thrilled, and I’m sure it’s still spotlessly clean like this right? ?